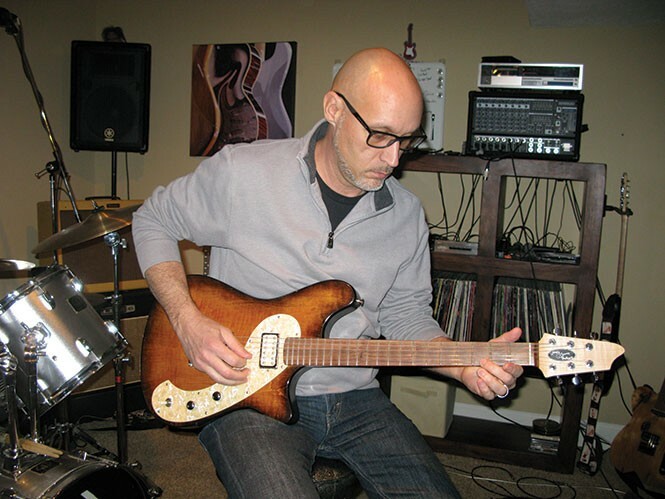 The long and winding road from rock star to builder of custom electric guitars. Justin Pearce decided one day that he could no longer take his band from city to city as a rock guitar road warrior. It was time to come home to a wife and children. So he settled down in Sandy, Utah, to concentrate on Joe's Guitars (JoesGuitars.com), a builder of custom electric guitars. For many years, through the '80s and early '90s, when I played at Musicians Institute of Technology in Hollywood and then with my band all up and down the West Coast, I was never happy with factory-made guitars. I found myself always changing the pickups and pots, hot-rodding the necks and frets to play better. At major rock clubs, other musicians would pick up my guitars and ask me to modify theirs to play like mine. Custom guitars are not for everyone. I build guitars for people who know music and really know the difference. Are there others who do what you do? I am not the only one in the valley who builds guitars. There are many custom choices. I know of one guy who is using a 3-D printer. So, yes, there are a lot of choices. Do I really need a hand-built guitar? With hand-built, you choose the wood for sound, you select the electronics for tone, fret size is matched to you for playability and you get any color you want. For professionals, or serious weekenders, you can buy a $3,000 major-brand guitar and then have it customized, or spend around a third less here in Utah for hand-crafting that has been made to measure for you. It's not for everybody, but if it's for you, you know it. When did you decide to build guitars for others? In 1991, I left the San Francisco band and settled down in Salt Lake City. In 1994, I started Joe's Guitars. At first, I bought bodies and necks and assembled them thinking I could add something special. After a while, I realized that, if I had quality tools, I could make everything myself and not have to do as much after-market customizing because I could personalize them to the individual player from scratch. So I invested heavily in good shop tools. That was great because now I could improve the feel of the neck and extend the range of wood choices. I spent a lot of time experimenting with different woods and pickups to get that great sound, searching for that amazing guitar so that sound just oozes from your hand. I want it to feel like home, like this guitar is meant to be for me.